Werescorpion? There Scorpion. There Dungeon. Leaving grappling rules, we now turn to were-creatures, because, why not? It is worth noting, because it will come up again (and there will be a quiz) that these creatures have a ‘hit dice range’. This was not common at the time. Normally, a monster had set HD, and that was that. One reason for the plethora of humanoids was to provide challenges across multiple levels, so you’d start with kobolds and work up to orcs, hobgoblins, bugbears, and ogres. Having hit dice ranges meant a creature could be a threat across a wider level range. And, since hit dice was basically the ‘level’ of the monster, affecting saving throws and some types of magic (such as sleep), this simple innovation by Mr. Hargrave foreshadowed 3.x’s ‘monsters and PCs follow similar rules’ design. 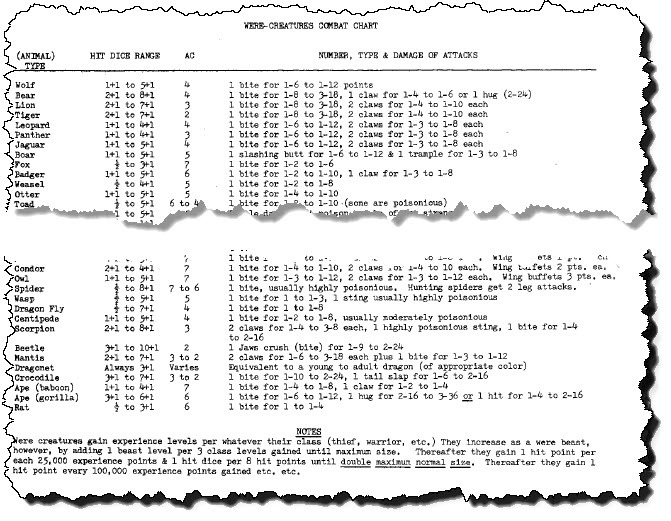 Damn, I need to start cataloging all the mechanics in Arduin, many predating even AD&D 1e, which became standards in D&D 3.0. I admit to being a bit confused by the experience rules… does his mean that a sixth level warrior becomes a second level wereowl? Also, I assume the DM is supposed to interpolate the attack damage against the hit dice range. Ditto AC, for the few cases where it changes. I’ve Got A Golden Book Of Dinosaurs And I’m Not Afraid To Use It! Next we have a bunch of basic dinosaur stats, roughly 1 1/4 pages, and then they turn into sea creature stats. Not Shown: Icthyarsaurs Are Playful Unless Hungry Or Aroused. Good To Know. Not really a lot to add or comment on. These don’t dramatically extend the existing dinosaur stats; maybe Dave just wanted his own chart, or disagreed with how Gygax rated various extinct critters. Indeed, the exact hit dice of a T-Rex has been a subject of considerable paleontological infighting over the years, leading to more than a few academic careers being ruined by the incessant backstabbing. Jack Horner’s famous speech at Indiana University, ’15 Hit Dice, Armor Class 3, And No Claw Damage’ is often cited as the ‘Attack on Fort Sumter’ of the still-ongoing debate. Oh, being scraped by a shark’s skin does 1-12 damage… when you consider a typical human had 1-4 hit points, total, this makes you wonder why sharks even needed to bite. Just brush past the prey, and it’s dead. Half Percentages? Yeah, They Were A Thing. Just putting this here to show you what we went through in the absence of any formal ‘Escape Artist’ checks. Note, also, that neither Strength nor Dexterity formally figure in to these numbers… just raw class+level. 4-8 Greater Dragons. ‘Nuff Said. I said, this was going to be a short one. (“That’s what she said!”) I’ll leave you with a bit of a ‘teaser’ for next time… a segment of the Encounter Chart, because we’re finally at the monster section. (OK, we’re going to get through weather, diseases, and mists first… but here’s the encounter chart, anyway.) Shydras, Demon Locusts, and Ibathenes, oh my!